Stormwater pollution is a challenging water quality problem. Unlike pollution from industry or sewage treatment facilities, which is caused by a discrete number of sources, stormwater pollution is caused by the daily activities of people everywhere. 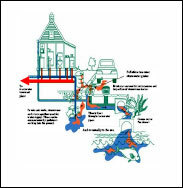 Rainwater and snowmelt run off streets, lawns, farms, and construction and industrial sites and pick up fertilizers, dirt, pesticides, oil and grease, and many other pollutants on the way to our rivers, lakes, and coastal waters. Stormwater runoff is our most common cause of water pollution. Because stormwater pollution is caused by so many different activities, traditional regulatory controls will only go so far. Education and outreach are key components to any successful stormwater program. Water pollution occurs when any substance, which is not naturally found in harmful quantities in the environment, enters a natural body of water. When a substance leaks or spills from its container, or is poured or washed onto the ground, it usually flows into a storm water drain. These drains carry the pollutant untreated, to the nearest natural water body such as a stream, lake or harbor, spreading the pollution to the wider aquatic environment. Sometimes the substance soaks into the ground, contaminating the land and eventually polluting underground water reservoirs called 'aquifers'. These aquifers are often used for drinking water or for manufacturing and farming activities. Usually, near surface aquifers contribute water to adjacent streams and lakes. Everyday, many such "releases" of pollutants occur throughout the United States due to ignorance, inattention, accident or malice. Whether large or small, at home or work, they all result in the pollution of our environment. How do these substances harm the environment? Damage fish gills so they can't breathe, poison animals and burn plants. They contain cancer-causing agents that build up in fish and shellfish. Petrol and its vapors are a major fire and explosion hazard, especially in confined spaces such as storm water pipes. The heavier components of these hydrocarbons accumulate in the bed sediments of a water body. One liter of oil can taint two Olympic sized swimming pools of drinking water and cover 100 square meters of surface water, oiling birds and other surface dwelling creatures and preventing oxygen from getting into the water. Toxic substances in waste oil such as metals, sulphur and acids can dissolve into the water causing harm to aquatic creatures. The heavier components of oils also build up in the bed sediments of a water body. Can all be poisonous to creatures that come in contact with them. They prevent light from entering the water, making it difficult for plants to get the energy they need to live and for animals to find food. The chemical and biological processes that occur when foodstuffs decay in a body of water use up its reserves of oxygen, suffocating the creatures that live in it. Clay, silt and sand are major pollutants. When they are washed by rain from subdivisions, construction sites, building depots and stockpiles they smother streambeds and mudflats, choking the creatures that live there and destroying habitats. Often extensive visible plumes of sediment can be seen flowing into our coastal waters. Nutrients such as phosphates, nitrates and those contained in domestic sewage promote the uncontrolled growth of plant and bacteria populations within the aquatic environment. Waterways can be choked with weeds or depleted of oxygen by unnaturally high populations of micro-organisms. Include battery acid, vinegar, some cleaning compounds, acetic acid and cement wastes. The degree of corrosiveness in liquids is measured in pH units. These range from 1 to 14, with 7 being neutral. Levels of pH outside the range of 6-9 damage sensitive tissues such as eyes, gills and skin, make it impossible for juvenile creatures to survive and burn or kill mature fish, plants and insects. Such as detergents, degreasers and disinfectants all cause harm to aquatic plants and animals through poisoning, burning and irritating their sensitive membranes and tissues. Even those claiming to be "bio-degradable" or "environmentally friendly" can be toxic to fish, removing oxygen from a water body as they are broken down. Such as lead, cadmium, nickel, mercury, zinc and copper are commonly found in commercial and industrial wastewater. They inhibit plant growth and poison aquatic creatures by accumulating in their bodies. Metals do not break down in the environment and hence build up through the food chain and accumulate in the bed sediments of a water body. Is found in some cleaning compounds, swimming/spa pool water and as a treatment chemical in our drinking water. While the concentrations found in these uses are not harmful to humans they are toxic to bacteria, insects and fish. Even a very small quantity of a pollutant or just one accidental discharge, can drastically alter the quality of a stream. Fish, insects and plant life can be killed and habitats destroyed. A polluted stream may never fully recover. Portions of this page were sourced from the Wai Care Programme. View their pollution information at http://www.waicare.org.nz/site/main/stream-info/pollution.aspx .